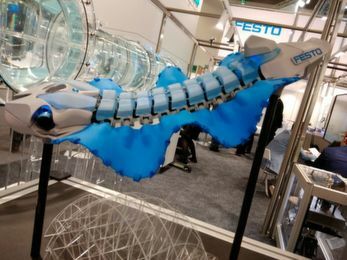 A recent report by the European Chemical Industry Council (Cefic) tracks the current chemicals industry in the European Union. 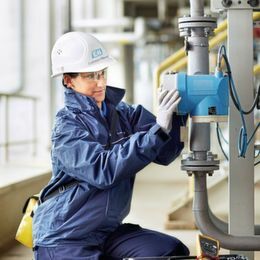 In 2018, chemicals output was down by 0.7 % while chemicals sales rose by €18.2 billion in the same year. 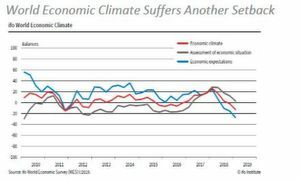 According to the latest ifo World Economic Survey (Q1-2019), assessments and expectations of the economic situation dropped significantly, although experts’ overall view is still slightly positive. The global economy is slowing down more and more. Deterioration of the economic climate was especially strong in advanced economies. The United States in particular saw a slump in expectations and assessments, while in the European Union, experts also revised their estimates significantly downwards (source, results of the ifo World Economic Survey,WES,Feb-11, 2019). 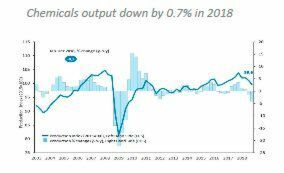 Production in the EU chemicals sector posted a decline of 0.7 % in 2018 compared to 2017. The results of 2018 were mainly affected by the second half of the year, with output declining in Q3-2018 and Q4-2018 by 1.2 % and 3.5 % respectively compared to the same period of 2017. Base chemicals were most affected compared to other sectors. Producer prices were above the previous year’s level, growing 3.7 % in the EU chemicals sector in 2018. Total sales (domestic and exports) in the EU chemicals business were 3.3 % above the previous year’s level. 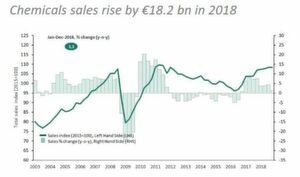 Sales in 2018 posted a value of €576.9 billion, up from €558.7 billion in 2017. Sales growth is mainly driven by higher growth in producer prices. Data analysis shows that domestic sales (inside the EU 28 area) grew 2.9 % from 2017 to 2018, reaching the value of €415.2 billion. 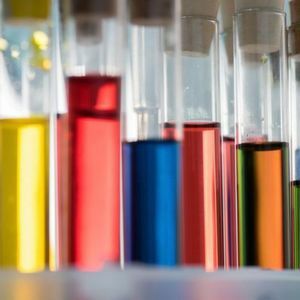 EU chemicals exports outside the EU28 area reached the value of €161.8 billion through December 2018, up from €155.2 billion during the same period of last year. 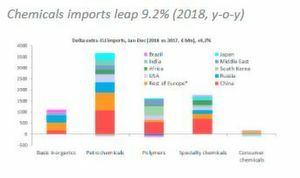 EU chemicals exports to the USA reached the value of €31.8 billion in 2018, up from €28.9 billion in 2017 (10.3 %). 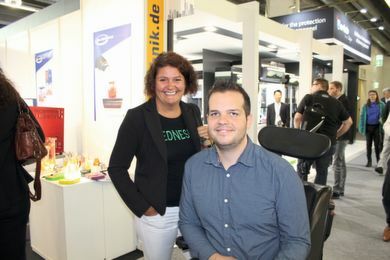 They went up mainly in petrochemicals (+€1.3 billion) and specialty chemicals (+€1.2 billion). EU chemicals exports to China fell significantly in petrochemicals (-12.5%) and went up in consumer chemicals (27.1%). EU chemicals imports outside the EU 28 area reached the value of €116.6 billion through December 2018, up from €106.8 billion in 2017 (9.2 %). EU chemicals imports from the USA reached the value of €24.4 billion in 2018, up from €23.7 billion in 2017 (2.7%). They went up mostly in petrochemicals (+€368 million). EU chemicals imports went up significantly from China (+€2.5 billion), mainly in petrochemicals, polymers and specialty chemicals. The net trade surplus was €45.2 billion in 2018, down from €48.4 billion in 2017. As expected, the largest EU chemicals surplus occurred with rest of Europe (€10.1 billion). EU chemical show ever registered a trade deficit with Japan, South Korea, China and India. The EU chemicals surplus with the USA went up from €5.1 billion in 2017 to €7.5 billion in 2018. Petrochemicals and specialty chemicals contributed most to the additional surplus of 2018 compared to 2017. 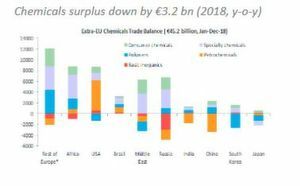 The EU chemicals trade balance with China shifted significantly from a surplus (+€1.3 billion) in 2017 to a trade deficit of €881 million in 2018. The EU posted a strong deficit with China in petrochemicals (€3.3 billion in 2018). 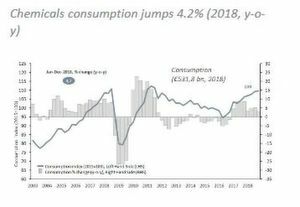 EU chemicals consumption of the EU single market reached the value of €531.8 billion through December 2018, up from €510.4 billion last year (+4.2 %).